By Tracey D. Duffy, B.A. The face of law enforcement has changed over the years and the thought of women entering the field of law enforcement is no longer a fight or a dream, but a reality. Most people think of law enforcement as a male dominated field, but that image is changing. There are women all across the country that are wearing police uniforms protecting and serving their communities. The first women hired by the New York City Police Department were called “matrons” in the 1840’s. These women had limited powers to search and were required to tend to female prisoners. They were also charged with dealing in matters that specifically affected women and children. By the early 1900’s the first female police officer had been hired and given full arrest powers. Throughout the 1900’s women were continuing to make huge strides within the law enforcement profession, as was shown with the hiring of a female officer by the Los Angeles Police Department, the creation of the International Association of Policewomen, and the hiring of the first African American female police officer. In the 1960’s, women continued to make their impressions felt in the field as they began working as patrol officers. In the 1980’s the first female was named as the chief of police and later in the 1990’s the first African-American female earned that rank as well. In the 2000’s, women began making their mark as there was a large increase in the number of females that entered the law enforcement profession. Women in law enforcement utilize a different style of policing and rely less on physical force and more on communication skills. Despite this difference in policing styles women can be just as effective as men in the profession. It has been determined that police officers must have a blend of traits and characteristics that include empathy, effective communication, compassion, intelligence, and the ability to relate to people on a personal level. Women have a natural ability to communicate and relate to people on a personal level. This helps them in having the capability of deescalating complaints and potentially violent confrontations, which in turn reduces the number of citizen complaints against officers. As women continue to enter into law enforcement, they will continue to assist their departments in mirroring the communities they serve as well as becoming positive role models to other women on the department and in the world. Some individuals have made the decision to become a police officer at a young age, while others decided much later in life. Regardless of when you make the decision to become a police officer, you should know that this career is not for everyone. If you have the interest and are a motivated individual than there are some minimum requirements that must be met before you can enter into the lengthy hiring process. For example, all applicants must be at least 21 years of age, a United States citizen and have an Associate’s Degree or at least 60 college credits from an accredited college or university. Once an applicant has met the minimum requirements, they will be invited to take a written test, which is designed to measure your general abilities which are obtained through education and life experiences. The next step in the process is the physical fitness test, where applicants will be tested in the areas of aerobic capacity, flexibility, upper body and abdominal strength as well as endurance. There are additional steps in the hiring process, which include an oral board interview, a polygraph examination, and a background investigation. After successful completion of the three previously stated steps, an applicant will be given a tentative offer of employment. The applicant must then pass a psychological and physical examination. 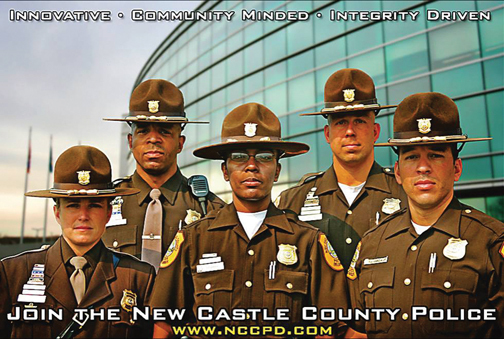 Applicants who successfully pass all stages of the hiring process are then hired and attend the New Castle County Police Academy. During the six month Academy, recruits are taught police procedures, local and state laws, use of firearms, community relations and specialized driving. They are also taught additional lessons and skills necessary to perform the role of a police officer. After graduation, the new officers will be assigned a Field Training Officer for 16 weeks before they “hit the streets” on their own. Women who decide to make law enforcement a career should get to know and research the following organizations who are devoted to the advancement of women in the law enforcement profession: the Mid-Atlantic Association of Women in Law Enforcement (MAAWLE), the National Association of Women Law Enforcement Executives (NAWLEE) and the International Association of Women Police (IAWP). These organizations, as well as a positive support group, will further assist women who enter this challenging and rewarding career. 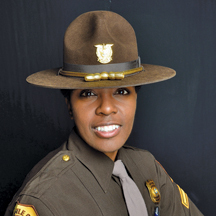 Officer First Class Tracey D. Duffy grew up in the Rehoboth Beach, Delaware area and graduated from Cape Henlopen High School in Lewes, Delaware. She attended Delaware State University and graduated with her B.A. in Sociology with a minor in Biology. She has proudly served her country as a member of the United States Army Reserves and the Delaware Army National Guard. Officer Duffy had always aspired to join the law enforcement community and began her career in law enforcement with the New Castle County Police Department in August 2004. She has served on the department’s Patrol Division and is presently assigned to the Professional Development Unit where she manages the complex hiring process for the department. Officer Duffy is also a recruiter as well as a member of the Honor Guard. She is a lifetime member of the Mid-Atlantic Association of Women in Law Enforcement (MAAWLE) and the Delaware Chapter of the National Organization of Black Law Enforcement Executives (NOBLE). Officer Duffy is a proud single mother who enjoys spending family time with her daughter. For more information or to speak to a recruiter please call the Professional Development Unit at (302) 395-8140.